Assisted living facilities must focus on quality and exercise prudent expense management to achieve sustainable profit margins if they hope to stave off competition and remain profitable. However, many individuals entering a leadership position are faced with managing a business budget and have limited or no formal training in accounting, finance, budgeting, or statistics. 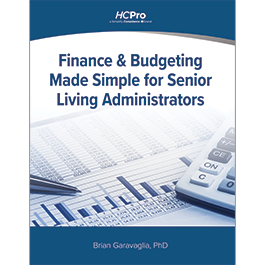 Finance & Budgeting Made Simple for Senior Living Administrators will provide readers with the financial and decision-making skills they need to achieve quality and compliance on dwindling profit margins. Brian Garavaglia, PhD, is a long-term care administrator, gerontologist, consultant, author, and educator. He has 27 years of experience in healthcare, especially in dealing with older adults in the long-term care setting. He currently works as a nursing home administrator in Michigan and is also affiliated with colleges and universities within Michigan and Arizona.